Nancy Thomas is a nationally-known contemporary artist who has lived and painted in historic Yorktown, Virginia for the past 30 years. Her work is prized throughout the country for its wonderful color, warmth and style. Her art appears in the homes of thousands of collectors as well as in magazines and in decorator books in museums, in Hollywood films, on Broadway and on television. Nancy has given one-woman shows across America and abroad, and has been commissioned for numerous special works by a variety of institutions such as Colonial Williamsburg, the Museum of American Folk Art and the White House. Nancy Thomas is a renowned local artist and has galleries in Williamsburg and Yorktown, Virginia. Nancy Thomas' art work is a favorite of Sandi's, and over the years Sandi has assembled quite a collection. 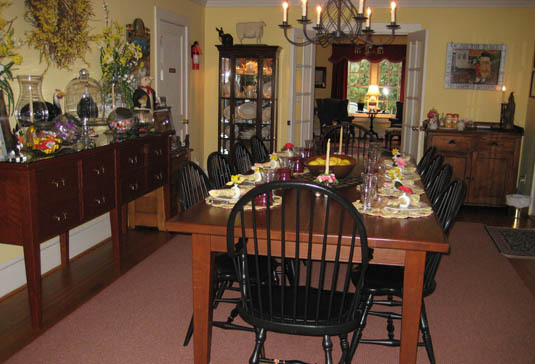 The B&B's breakfast room and solarium boast a seasonal display. Depending on the time of year, the B&B rotates a collection of Spring, Summer, 4th of July, Autumn, Christmas, Winter and other art work. 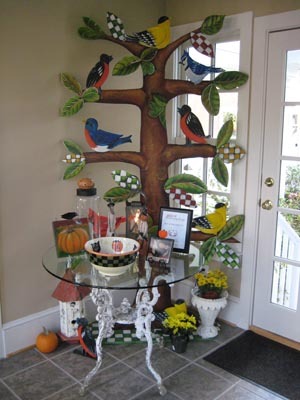 Sandi's latest acquisition, the 8 foot tall Bird Tree, is a fixture in the solarium and is displayed on this page. 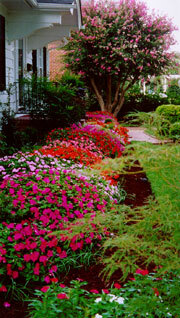 "The Boxwood Inn of Williamsburg is a wonderful bed and breakfast next time you visit the Historic Triangle. It's also a great place to check out Nancy Thomas artwork! The Boxwood Inn just installed the 8ft tall Bird Tree by Nancy Thomas and it looks fabulous - stop by and see for yourself. We are providing a link the bed and breakfast on Richmond Road here. Bookmark for the next time you visit Williamsburg."